The North Shore is small and the North Shore equestrian world is even smaller. Already a tight-knit community simply by trade, horse and pony owners develop close bonds with one another. In many ways, these relationships are fostered from the sale and resale of the animals they care for, manage, train, ride, and show. Those who compete in equestrian sports also tend to run in the same circles, as parents pass down their passion for competing in the saddle to their children. It is not uncommon for horse owners to know one another by name, especially on the North Shore, where an enthusiasm for all things equestrian runs in the gene pool. Katy Deer, a Highland Park equestrian and mother, started riding when she was 4 years old. “It’s always been my passion,” adds Deer, who learned how to ride from Aleta Walther, who Deer describes as “one of the first female jockeys.” Deer was a natural, competing and qualifying for a number of hunter and jumper shows at an early age while working for different farms along the North Shore. For Lily’s first birthday, they had private pony rides. While the other kids were fearful of the imposing animal, Lily was fearless. When she was on the pony she didn’t want to get off; when she was off, she wanted more turns. Deer promised Lily she could take lessons when she was older. By five years old Lily was riding, just like her mother. Deer couldn’t justify paying for a trainer when she had the breadth of experience herself, so mother and daughter became a team, breaking in ponies and then selling them. Lily was a natural. With her mother training her, she excelled at the jumps and had an instinctive relationship with her first pony, Reggie, a small “green” (inexperienced) pony. It took Deer about six months to break him, with Lily riding after school. In 2010, when she was hardly 11 years old, Lily competed in the United States Equestrian Federation’s Pony Finals in Kentucky and finished 11th over the fences (the jumping phase of the competition) and 15th overall. The Deers now have a large German Riding Pony (of Holsteiner blood) named April. April is a beautiful warmblood who “can end up being a jumper or an equitation horse,” says Deer. The first time Lily showed April, she finished fifth in the Children’s Mini-Medal Final at the Lamplight Equestrian Center in Wayne, Illinois. A former instructor of Deer’s, Danny Jayne an esteemed trainer at Jaynesway Farms in Bartlett, Illinois, helped arrange the sale of April to the Deer family. Concidentally, Jayne also sold Deer her first pony, Milkshake, a dappled grey who stood 13 hands high (the unit of measurement for an equine). Kristan Lacey, a Lake Bluff mother and lifelong equestrian, began riding ponies in her youth. As is usual in the world of competitive horse riding, when Lacey was 14 she outgrew the pony she had ridden to win a number of championships in the sport of show jumping. Her family sold her pony, Snow Bear, in favor of a horse, so that Lacey could compete in a different class. Lacey now has two daughters in the sport. Lacey’s oldest daughter, Emily’s, first memory of riding is of falling off a pony named Panda. “People say the more you fall the better you are, because if you can learn how to ride the really hard ones, you’re going to be a more accomplished rider. So falling can be a good thing,” says Lacey. “As long as you get back up,” adds Emily. Lacey tried everything to get her daughter interested in other sports, but ever since getting on a pony at 13 months, Emily never wanted to do anything else. “I think it’s innate,” says Lacey. It might be. Her youngest daughter, Fiona, is 18 months and already she knows to call out “helmet, helmet,” at the barn “and tries to get on every horse that walks by,” says Lacey. Last year, Emily, then 14 years old, came in first in a hunter derby out of 56 other people, riding her mother’s horse, Bandit—a big bay American thoroughbred. And her mother still competes whenever she can. 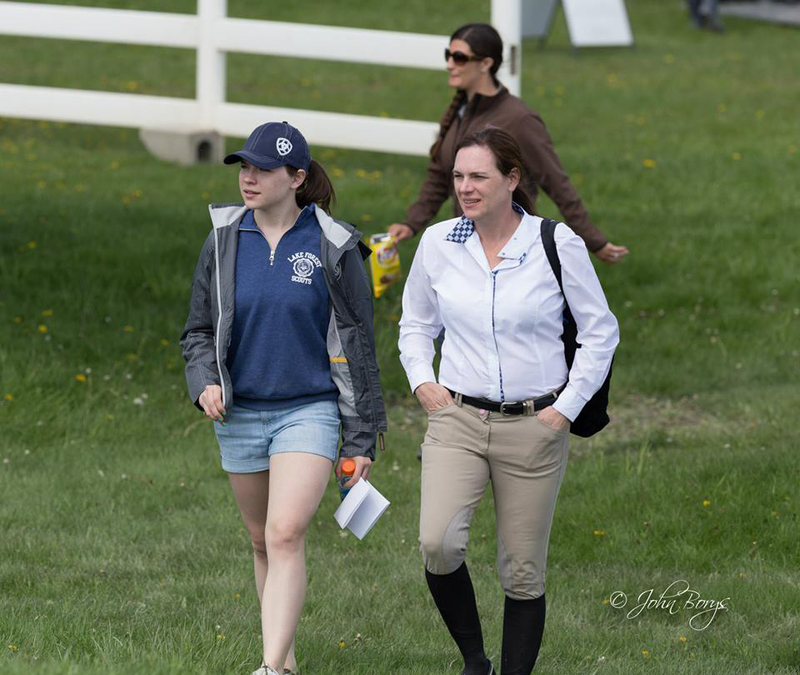 In fact, all three Laceys rode together at the final horse show of the Northern Illinois Circuit last month, with Kristan and Emily showing and the youngest, Fiona, competing in the lead line.